SLOPE/W is the leading slope stability software for soil and rock slopes. SLOPE/W can effectively analyze both simple and complex problems for a variety of slip surface shapes, pore-water pressure conditions, soil properties, and loading conditions. Pore-water pressures can be defined using piezometric lines, spatial functions, or the results from other GeoStudio finite element analyses. Values can be displayed as contours on the geometry to reveal PWP values used in the analysis. 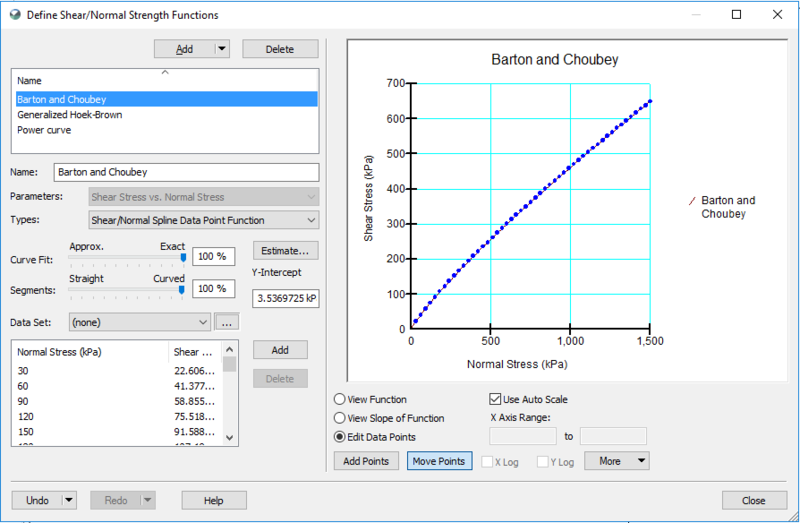 Rapid drawdown analysis can be conducted using the pore-water pressures defined using piezometric lines, transient finite element GeoStudio analyses, or the multi-stage rapid drawdown technique. SLOPE/W supports a comprehensive list of material models including Mohr-Coulomb, undrained, high strength, impenetrable, bilinear, anisotropic strength, SHANSEP, spatial Mohr-Coulomb and more. Limit state design or load resistance factor design is handled by specifying partial factors on permanent/variable loads, seismic coefficients, material properties, reinforcement inputs and more. SLOPE/W can be used to complete a stability analysis with the objective being to check an ultimate limit state in accordance with various limit state design approaches such as Eurocode 7, Norwegian Standard NS 3480, and British Standard 8006. The stability analysis is completed with partial factors applied to characteristic loads and soil strength parameters. This article looks at the SLOPE/W probabilistic analysis capabilities relative to the James Bay hydroelectric project. It required the construction of fifty kilometers of dykes on soft and sensitive clay. Divergent views were prevalent regarding the selection of safety factors and strength properties. The project has consequently become an important and often-cited case history. The purpose of this illustrative example is to show how anchors can be used to improve the stability of a system. 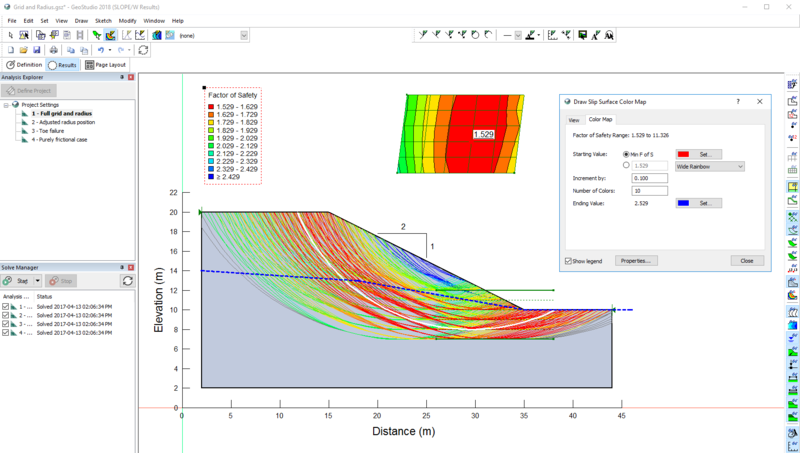 Features of this simulation include: Spencer analysis method, homogenous material using the Mohr Coulomb soil model, a dry slope with no pore-water pressure, two sloping anchors, and the entry and exit slip surface option. Mechanically stabilized earth (MSE) walls are structures for retaining the earth under bridges, highways, and waterfront properties, to name a few. Designing a MSE wall requires consideration of the geometric configuration and reinforcement requirement to ensure both internal and external stability. 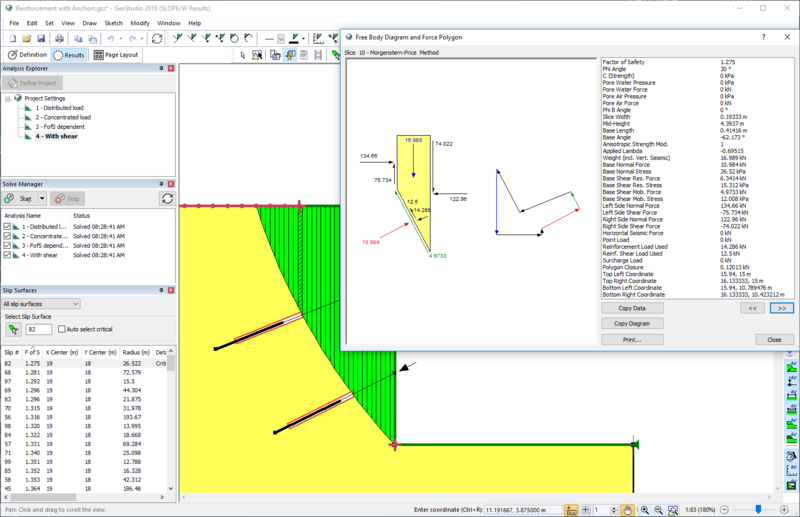 Create a SLOPE/W analysis and set up the problem workspace. Choose options for limit equilibrium or finite element stress methods, pore-water pressures, trial slip surfaces, tension cracks, probabilistic and sensitivity methods, pseudo-static loading, partial factors, convergence criteria, and more. Create a SLOPE/W analysis, and then draw the regions in your domain using CAD-like drawing tools, including drawing polygon and circular regions, coordinate import, copy-paste geometric items, length and angle feedback, region splitting and merging, and direct keyboard entry of coordinates, lengths, and angles. Alternatively, import AutoCAD DWG or DXF files directly into GeoStudio to create your domain geometry. Define the material properties for your analysis, assign them to regions on the domain, and then define your initial pore-water conditions. Select from a comprehensive list of soil and rock material models including Mohr-Coulomb, undrained, high strength, impenetrable, bilinear, strength as a function of depth, anisotropic strength, generalized shear-normal function, SHANSEP, and generalized shear-normal function (for typical rock material models including Hoek-Brown). Define the pore-water pressure conditions as either piezometric lines, spatial functions, finite element computed, or Ru and B-bar approaches. Define slope reinforcement properties to simulate ground anchors, soil nails, piles, or geosynthetics. Define surcharge loads to simulate a pressure applied over a portion of the ground surface, such as a footing. Any other loads can be modeled on the domain as a point load. You can also specify seismic loading on the domain by setting horizontal and vertical coefficients that represent a force created by seismic or earthquake accelerations. Define a set of trial slip surfaces that SLOPE/W will use for computing a critical factor of safety. A number of options for specifying slip surfaces are available, including as entry and exit zones along the ground surface, a grid of slip surface centers and radius tangents, blocks of slip surface intersection points, or pre-defined slip surface line segments. When your problem is completely defined, start the analysis process in the Solver Manager window. Once the Solver is running, multiple slip surfaces are solved in parallel, allowing for faster performance. The Solver Manager displays the solution progress, allowing you to cancel or stop/restart if necessary. While the solution is in progress, you can look at preliminary results in the Results window. When the Solver is finished, the critical slip surface is displayed, along with the critical factor of safety. Use a slip surface color map to visualize the variability in factor of safety with slip surface position. You can filter the slip surfaces displayed to a specific factor of safety range. Interactively select any analyzed slip surface to graphically display the forces on any slice or information about the sliding mass. Display plots of computed results over the slip surface, such as various strength or convergence parameters along each slice. Generate reports of the definition and results, and export into other applications such as Microsoft Excel for further analysis. SLOPE/W offers simple but powerful analytical capabilities when used in combination with other GeoStudio products. Using SEEP/W finite element pore-water pressures in SLOPE/W makes it possible to deal with complex saturated/ unsaturated conditions or transient pore-water pressure conditions. From a transient analysis, we know the pore-water pressure conditions at various points in time. Using these time-varying pore-water pressure results in SLOPE/W makes it possible to look at the changes in stability with time. Earthquake shaking of ground structures creates inertial forces that may affect the stability of the structures. The shaking may also generate excess pore-water pressures. Both the dynamic stress conditions and the generated pore-water pressures can be taken into SLOPE/W to study how an earthquake affects the earth structure stability and deformation.